The 2018 Top Dogs have been published. See the Records Page. The 2019 calendar has been uploaded. Similar to straight racing done by whippets in NAWRA, WRA and CWA, the hounds race 200 yards on a straight, flat track. Hounds are graded according to previous racing experience or using the LGRA “WAVE”, a weighted average of the dog’s last three race meets. There are three programs with heats made up of a maximum of four dogs. 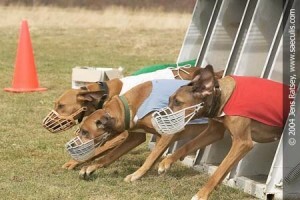 All dogs must run with properly fitted muzzles and race blankets. Dogs are released from racing boxes or hand-slipped, depending on the club and equipment available. Winners earn points towards the Gazehound Racing Champion title (12 GRC points). While working towards this title, the hound also earns points towards the Superior Gazehound Racing Champion title (30 NRC points).